MAGPET, North Cotabato – Tired and disgruntled, a couple from the hinterland barangay of Magpet, North Cotabato surrendered to the Army’s 19th Infantry Battalion, Tuesday, August 7. The surrenderers, “Alias George” and his wife “Alias Joan” were formerly full-time members of Guerilla Front 53 and Pulang Bagani Command (PBC) 3, under the outlawed Communist New People’s Army Terrorist (CNT) that operates in North Cotabato. The couple was accompanied by local officials headed by village Chief Roldan Pelonio when they surrendered to 1Lt. Prolen Bonacua, Commanding Officer of Alpha Company at Barangay Manobo of the said town. 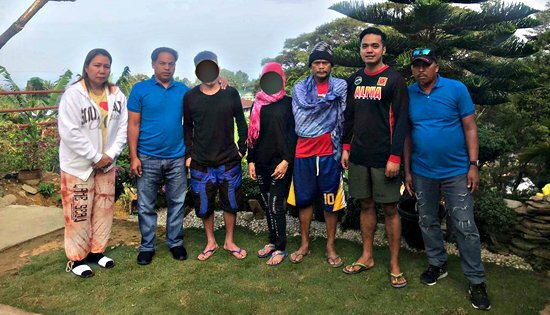 They are now the latest addition to the list of former NPA rebels who surfaced to 19th Infantry Battalion since April this year. Alias George has already acquired higher position in the organization. But still, he surfaced due to hardships and infighting among members. He also came to knew that the military together with the local officials were aggressively supporting the reintegration process of former NPA rebels. “I just want to live a normal life together with my wife and children, like our former comrades who already yielded ahead of us”, Alias George said. Meanwhile, Lt. Col. Ehrlich Noel Paraso, Commanding Officer of 19th Infantry Battalion said that documentary requirements for the enrollment of Alias George and his wife in the Enhanced-Comprehensive Local Integration Program (E-CLIP) will be immediately processed. He also reiterated his call to the remnants of the NPA rebels who are still out in the mountains to surrender for them to avail of the various programs of the government.